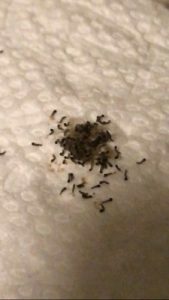 The tiny larvae are black. They have round heads and thin bodies. 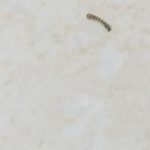 We aren’t positive what type of larvae our reader is dealing with, but we think they are probably moth fly larvae. 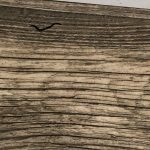 Readers discover clusters of larvae on their ceilings fairly often! We haven’t been able to figure out exactly how or why this happens, but we do have a theory we will share with our reader. Moth fly larvae, and most other types of larvae for that matter, eat decaying organic matter. Adult females lay their eggs on the surface of the food source that her larvae will eat. 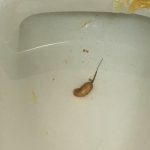 When the eggs hatch, the larvae can begin eating right away. The larvae then eat pretty much nonstop until they pupate and mature into adults. Our theory is that some other insect or bug died on the ceiling where our reader noticed this cluster of larvae. The remains of the dead creature is where the adult laid her eggs, and where the larvae hatched and started eating. 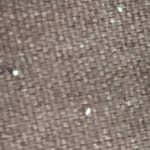 Therefore, our reader will need to scrub the ceiling down with a cleaning agent designed to kill organic matter in order to stop the cycle! 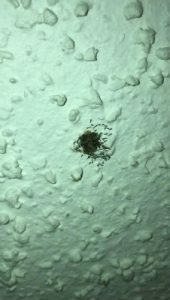 To wrap up, a reader discovered a cluster of small black larvae on his ceiling. 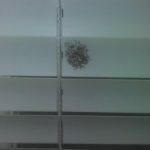 Although discovering creatures in your home is never ideal, it happens to everyone and usually isn’t something to worry about. 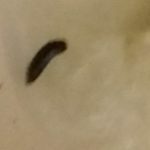 Moth fly larvae are harmless and shouldn’t be a source of stress in our reader’s life! A reader discovered a cluster of small black larvae on his ceiling. 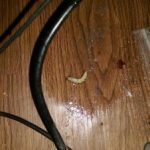 Although discovering creatures in your home is never ideal, it happens to everyone and usually isn't something to worry about. 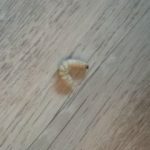 Moth fly larvae are harmless and shouldn't be a source of stress in our reader's life! I found a bunch of these hanging off silk like thread in my cupboard… traced them back to a jumper. I vacuumed the ones i could see as i couldn’t think of a better method as a lot of them were making silk like thread & heading to the ground. Just wondering how they got inside the jumper, I’m assuming while it was hanging outside on the clothes line to dry up.. otherwise no idea.